The INTEX Mega Wetset Chill II Floating Cooler features 6 cup holders to keep beverages within easy reach and holds up to 72 beverage cans with ice. With tough 16 gauge vinyl construction, this cooler is sturdy and features 3 air chambers to stay afloat. 4 heavy-duty handles make the cooler easy to transport, and it comes with a repair patch to fix minor tears and punctures.Can be used as the base for a 48-quart cooler (not included).Repair patch included to fix minor tears and tears and punctures. No need to get out of the pool for a nice refreshing beverage when you have an Intex Mega Chill! Designed with three air chambers for added safety, five built-in cup holders and two trays, durable handles, and a built-in cooler that holds refreshing beverages and ice, the Mega Chill is a convenient accessory for a refreshing pool experience. 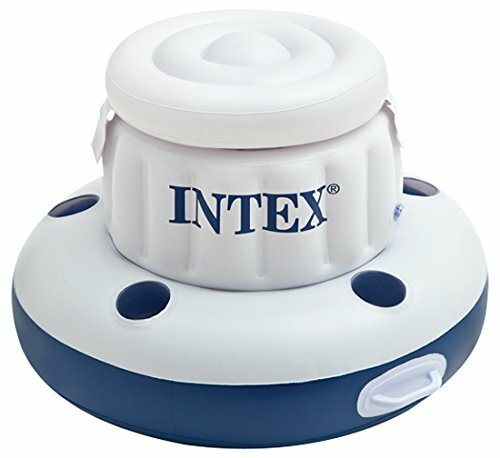 easy to use connectors are included to fasten it to other River Run products by Intex. Approximate deflated size: 35" diameter. Includes: Three air chambers. Five built-in cup holders. Durable handles. easy to use connectors. Repair patch. Take the Mega Chill floating cooler to the pool, beach, lake or park. Easy travelling, inflatable soft cooler fits up to 30 12 oz. cans of your favorite beverage in its center, lidded compartment. The perimeter of this 35 inch diameter floating cooler features 2 snack trays and 5 built-in cup holders. 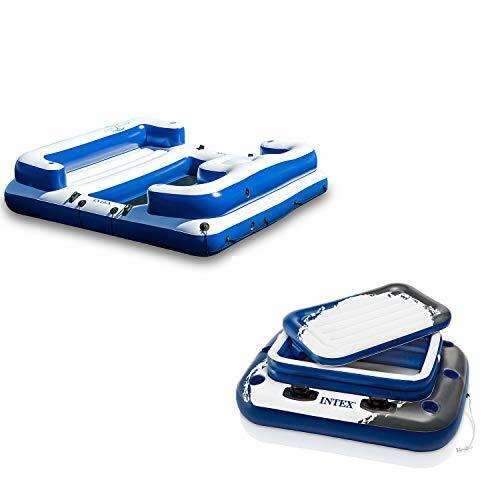 Durable grab handles make it easy to carry to the water and the included connector system makes it easy to connect to other Intex floats for even more fun on the water.Includes repair patch. 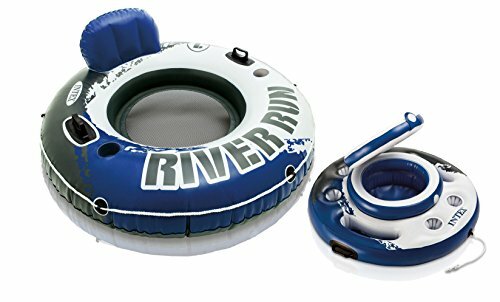 This Intex River Run I Inflatable Tube is designed to fit an adult, and it's perfect for tubing down the river, in the lake or in the pool. The Intex River Run 1 is designed for high-performance fun without the hassle of black rubber tubes that can give you tube rash or that uncomfortable burning sensation in hot weather. 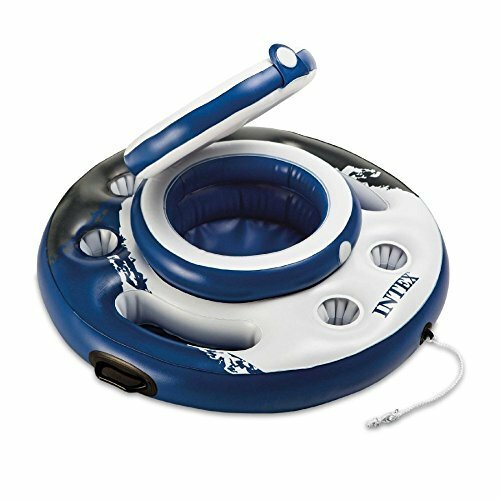 The Intex River Run I Inflatable Tube also features a quick-release valve that deflates the tube in less than 60 seconds. Its separate air chamber for its back rest lets you set the firmness just the way you like it. 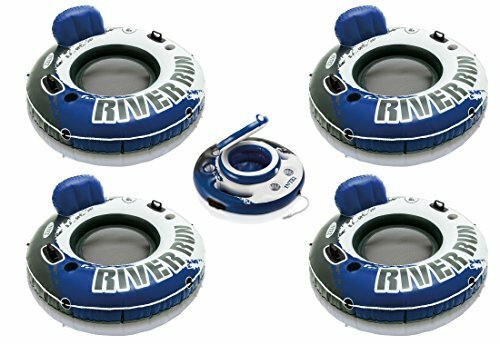 Tubing veterans, as well as new tubers will love the Intex River Run I Inflatable Tube. - Mesh bottom to keep you cool - Built-in backrest for easy cruising - Five cup holders around the outside for easy access to your drink Enjoy a refreshing beverage while you're out on the water with this 35 inch Mega Chill Floating Cooler by Intex. The Mega Chill floats along side you on those warm sunny days to keep everyone happy and hydrated. It offers enough room for up to 30 cans with ice and five cup holders. Plus, this Mega Chill cooler is made of 16 gauge vinyl, so it's extra durable. 58820EP Features: -Mega chill. -5 Cup holders around the side. -Two heavy duty handles for easy carrying. -Holds 24 soda cans plus ice. -For adult use. -Inflated diameter: 31". Product Type: -Tube. Color: -White / Blue. Age: -Adult. Style: -Inflatable. Seating Capacity: -1 person. Dimensions: -Package dimensions: 11.94" H x 12.19" W x 3.88" D, 3.3 lbs. Overall Height - Top to Bottom: -11.94". Overall Width - Side to Side: -12.19". Overall Length - Front to Back: -3.88". Overall Product Weight: -3.3 lbs. Has Two heavy duty handles. 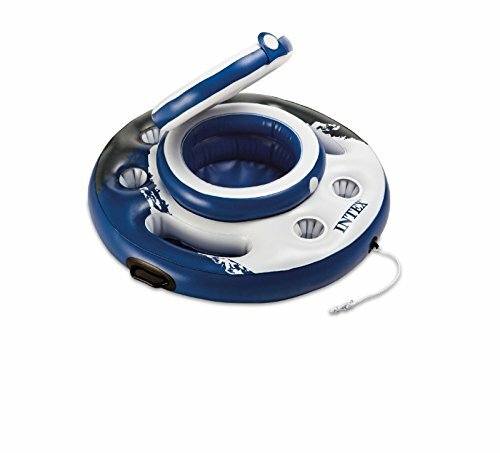 Its Easy to use connectors to fasten it to River Run by Intex. It Holds up to 24 soda cans plus ice and 5 built-in cup holders and 2 trays. It has 3 air chambers and Repair patch included. 35" (89cm ) diameter and 16 gauge (0.40mm) vinyl. It's a party for 5 out on the water! Catch some rays and chill on the lake, beach, or river all day long on the Intex Oasis Island 5 Seater Floating Lounge Raft and Beverage Cooler Float. A cool way to spend a hot day, this floating lounge raft is the ultimate water hang out for you and 4 others. With 4 cup holders, large backrests and armrests for added comfort, and a mesh lounging area to let water seep through, there's no doubt you won't be perfectly relaxed while you glide across the water. There's no need to get out of the water when you have the Intex Inflatable Mega Chill II Beverage Cooler Float by your side. There's nothing better than having your beverages floating nearby when you are in the pool or at the lake. This Intex Mega Chill keeps everyone happy and hydrated. It's made with durable, 16 gauge PVC vinyl and ready for summer after summer use. 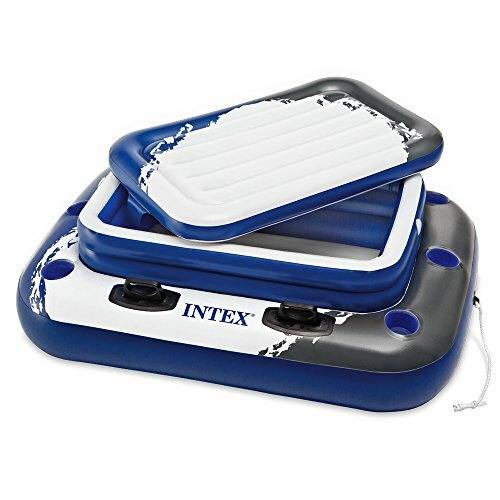 Intex Inflatable Mega Chill II Cooler Float, 48" x 38"
Floating Cooler For River, Kayak, & Pool - Reviews & Test- Which Is Best? Want more Intex Mega Chill Floating similar ideas? Try to explore these searches: Best Natural Fat Burners, Oem Rear Hatch, and Marble Maze Toys.